This month marks the third anniversary of Apple’s iPad. Since it hit the market, it has sold over 120 million units, and tablets in general have taken off. But large-screen tablets like the 9.7-inch iPad have remained dear for many budgets. The latest iPad and Microsoft’s new Surface RT start at $499. Even lower-priced, full-size tablets from name-brand companies typically cost $300 to $400. To pay significantly less, you’ve had to opt for a much smaller unit, in the 7-inch range. Now, major manufacturers are lowering prices for some larger-screen tablets to at least slightly below $300. This week I’ve been testing two of these sub-$300 models. 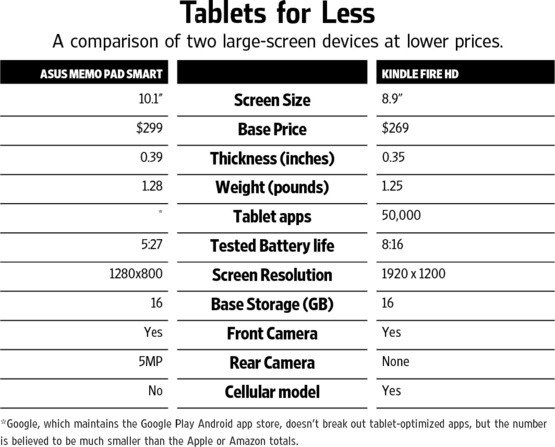 One is the largest Kindle Fire HD, with an 8.9-inch screen and a price that was just cut to $269 from $299. 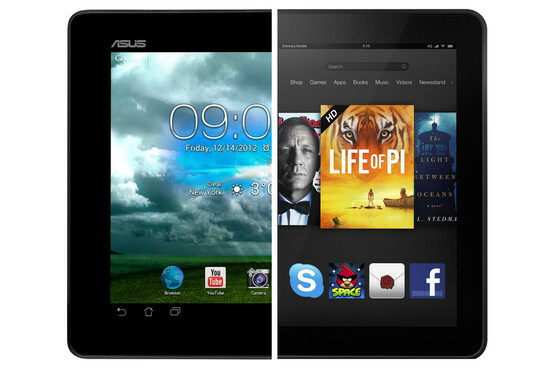 The other is a new 10.1-inch tablet from Asus, the MeMo Pad Smart 10.1, which sells for $299. The Kindle’s display is smaller than the roughly 10-inch tablets, but I consider it close enough to include in the category. What kind of large tablet do you get for under $300? Pretty good ones. While neither of the two I tested is as good as the iPad, each delivers decent value for the price. These two tablets are quite different from each other. The new, awkwardly named, Asus is a standard Android tablet, replete with built-in apps from Google, which makes Android, and a few from Asus. It has front and rear cameras, and the standard 16 gigabytes of internal memory. And it has access to the Google Play store, which features over 700,000 apps, only a fraction of which are designed to take advantage of a large tablet screen. The Kindle Fire HD 8.9, like its popular $199, 7-inch sibling, is technically an Android tablet. But it buries Android under Amazon’s own user interface, doesn’t feature Google’s apps and uses its own tablet-oriented, highly curated app store, which currently has 50,000 choices. It is capable of managing email, browsing and social networking, and running popular third-party apps and games. However, the Kindle Fire HD is mainly a hardware front end to Amazon’s vast collection of digital books, music and video. It also comes with 16 gigabytes of internal memory. The Asus, available at various online stores, runs the current major release of Android, called Jelly Bean, albeit a slightly older version of that software. However, the Kindle, consistent with its general demotion of Android to mere plumbing, is running a version of Android, Ice Cream Sandwich, that’s a whole generation behind. It’s available at Amazon.com. Perhaps the biggest difference between the two was in battery life. I ran my usual rigorous tablet battery test on each, turning the screen brightness to 75%, keeping Wi-Fi on to collect email in the background, and then playing videos until the units shut down for lack of power. The Kindle Fire HD 8.9 scored 8 hours and 16 minutes in my test, nearly two hours less than the iPad, yet better than many tablets I’ve tested. But the Asus MeMo did quite poorly, lasting only 5 hours and 27 minutes, almost 3 hours less than Amazon’s tablet. To get the Kindle for $269, you have to put up with ads, some on the lock screen and some in the form of recommendations for buying other content on the home screen. You can turn off the latter in settings—a new feature. But to get a model without the full-screen ads, which Amazon calls “Special Offers,” you have to pay $15 more, either when purchasing the device or by going to an obscure page on Amazon.com. Other downsides of the Kindle HD 8.9 are that it lacks a rear camera and its browser, called Silk, remains in my tests a bit slower at loading Web pages than either the iPad or standard Android browsers. On the other hand, the bigger Kindle offers a crisp, sharp screen, and can also be purchased for just $30 more with twice the memory, and for $399 with a cellular data option in addition to Wi-Fi. It’s lighter and slightly thinner than the full-size iPad, and slightly thinner and lighter than the MeMo 10.1, though the latter is also lighter than the iPad. It has much higher screen resolution than the MeMo’s, but less than the iPad’s. The Asus lacks a higher-memory or cellular model, though it has a memory-card slot for adding storage. It also has a nice feature that permits continuous burst shooting of up to 100 continuous photos. This photo feature worked, but some of the shots were out of focus. With the Kindle, I never had a crash or a glitch. On the Asus, I ran into a couple of minor, but annoying, problems. An Asus app called BuddyBuzz, one of many attempts by device makers to meld your social networks in one place, crashed frequently. However, I doubt many users will rely on it. And while playing movies rented from Google, I got several messages saying the movie couldn’t be authenticated. One tap fixed this, but no one wants to be interrupted like that while watching “Inception.” Asus said it couldn’t replicate either glitch but would investigate. Many people may prefer smaller tablets, which typically sell for around $200 or even less. But for those who want a full-size slate at a lower price, these two sub-$300 models are good choices.